(Trent Nelson | The Salt Lake Tribune) Helicopters make drops on the Dollar Ridge Fire near Fruitland in Duchesne County, Tuesday, July 3, 2018. At an emotional community meeting on Thursday night, state, county and federal officials detailed their plans to contain the Dollar Ridge Fire in the coming days, while trying to put those who have lost their homes or been evacuated at ease. 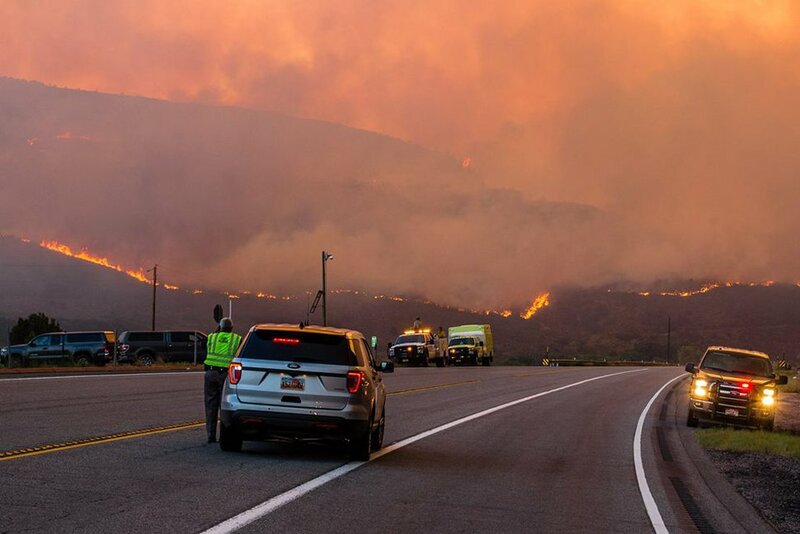 So far, the human-caused blaze has destroyed at least 90 homes as it continues to burn through dry timber and grass in the Uinta Basin, and authorities estimate that 1,000 more houses are at risk. “This thing has the ability to move a great distance in a short amount of time, and so that’s why we need to be thinking very strategically as far as a plan of attack — where we’re putting our resources, our firefighters, and using our aviation to the best of our abilities,” Tony Gilmore, the fire’s incident commander, told the crowd assembled in the Duchesne County High School auditorium. Utah’s largest burning wildfire has forced about 1,100 people to evacuate their homes, and there’s concern about the risk to oil, natural gas and power infrastructure, according to information from the Utah Division of Emergency Management posted on the Garfield County Sheriff’s Office’s Facebook page. Emergency Management spokesman Joe Dougherty confirmed his department sent out that information Thursday, but said it wasn’t meant to be seen by the public. He referred requests for comment to the incident team at the fire. Calls to the Dollar Ridge Fire’s command center weren’t immediately returned. The wildfire has now burned about 42,000 acres of “unbelievably dry” timber, grasses and shrubs in the Uinta Basin, about 100 miles east of Salt Lake City, and is considered 4 percent contained. Great Basin Coordination Center spokesman Norm Rooker said barring a rainstorm, crews will be working on the blaze for weeks. The blaze has spread about 5 miles per day since it began on Sunday, Gilmore said. Fire officials outlined a plan Thursday evening that includes securing areas of value, such as homes, infrastructure, power lines and U.S. Highway 40, which remained closed in both directions near Fruitland as of Thursday afternoon. Though it is smaller than last year’s 71,000-acre Brian Head Fire, the Dollar Ridge Fire has already burned substantially more structures. The blaze in Brian Head consumed 13 residences and cost about $34 million to fight. As it grew to 40,148 acres last June, it was considered the largest active wildfire in the country. After he spoke with a man who’d been evacuated because of the Dollar Ridge Fire, Mike Eriksson promised to check in on his chickens. When he pulled up to the property, Eriksson, the northeast area manager for the Utah Division of Forestry, Fire and State Lands saw that the chicken coop was fine — but the man’s home was gone. As fire officials opened the meeting up to questions, most attendees wanted to know specifics about their homes: When could they return? What were the conditions like in their area? Duchesne County Sheriff David Boren, who said he’s been inundated by callers asking for details about the 3,000 parcels of property endangered by the fire, pleaded for patience. “We’ll do the best we can with what we have,” he said. Though displaced residents have faced challenging circumstances, they’ve done so with resilience, officials said, and have come together as a community. There was at least one other silver lining Thursday night: Duchesne County Commissioner Greg Todd said officials had found a number of live chickens on a reconnaissance mission to the areas affected by the fire. Now they know where to bring them. After days of prime fire conditions, which have routinely pushed the blaze “off the rails,” crews fighting the Dollar Ridge Fire hope Mother Nature cooperates Thursday as they work to contain the growing inferno and keep it away from homes in the Fruitland area. To do that, a Type I team — the largest and most experienced type of wildfire squad — took over firefighting operations Thursday, Rooker said. The higher-level team was brought in after the fire jumped U.S. Highway 40, which remained closed in both directions near Fruitland as of Thursday afternoon. (Courtesy of Duchesne County Sheriff's Office) Emergency responders watch as the Dollar Ridge Fire nears Highway 40 near Fruitland on Wednesday, July 4, 2018. The fire later crossed the road, forcing crews to close the highway. Thursday’s firefighting mission was to keep the blaze away from subdivisions in the area, Rooker said. Workers dug by hand and by dozer fire lines near U.S. 40 and will try to connect those to existing lines to stop the fire from coming up behind and into residential areas. “It’s whether Mother Nature cooperates enough to allow those plans to be successful,” Rooker said. As of Thursday morning, Rooker said, weather conditions seemed to be working in fire crews’ favor, with more cloud cover and slightly higher humidity. Despite that, he said, it’s too early to tell if crews will make any gains on the wildfire into the evening. If the fire behaves as it has the past several afternoons — bolstered by high winds and dry fuels — crews likely won’t gain much ground. Many residents in the area are under mandatory evacuation orders. Those whose homes aren’t in imminent danger may be without power. Some smaller Moon Lake Electric Association power lines were damaged or shut down because of the fire, Rooker said. The company also decided after midnight to de-energize a main transmission line into Strawberry Valley, which includes all homes in the valley, the Daniels Summit Lodge and Strawberry Bay Marina, as the fire approached, according to a post on its Facebook page. When Gov. Gary Herbert visited Tuesday, he told reporters 20 to 30 structures had been destroyed, but Rooker said no one has been inside the fire area yet to assess the exact damage. At least two other fires were blazing across the state on Thursday: the Willow Patch Fire east of Richfield and the West Valley Fire, north of St. George. Officials estimated on Thursday that the Willow Patch Fire, which was human-caused, was smaller than initially thought. It was estimated to have burned 4,788 acres as of Wednesday but actually burned about 4,583 acres, according to a news release. Crews working that blaze said fire activity was “minimal,” with “isolated torching” of areas within the burn area and “creeping” burning of mahogany trees. The fire was 75 percent contained as of Thursday afternoon, and crews are “on track to meet the target of full suppression,” according to the news release. In addition to threatening one residential home, the fire was burning habitat for greater sage grouse, once a candidate for endangered species listing. In 2015, federal officials decided against listing the ground-nesting bird thanks to habitat restoration efforts led by Utah and other states and new federal land management plans restricting development in the bird’s sagebrush habitat. This week’s fires undermine costly efforts to bring the species back. The West Valley Fire, north of St. George, is now about 20 percent contained, up from 8 percent Wednesday. The fire has burned 11,716 acres and is also considered human-caused. 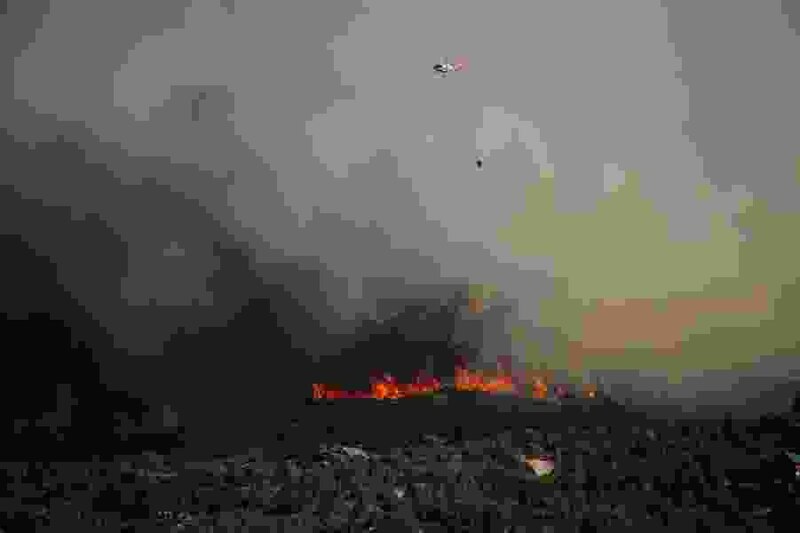 Firefighters had to stop what they were doing Thursday morning because someone flew a drone over the burn area near New Harmony, officials tweeted. Temporary flight restrictions were put in place in the area as crews worked to extinguish the blaze. With the drone in the airspace, some aircraft had to land. Correction: 8:36 a.m. • An earlier version of this story misstated the greater sage-grouses' endangered status and the groups and entities working to restore its habitat.